Many people think that having a facial is something you should have only as a luxury or every once in a while. The truth is that a regular facial is important for your skin, and your physical and mental well being. A facial is more than just a few cucumbers on your eyes and moisturising creams on your face. To book a facial for yourself, is an escape from the pressures of busy schedules, ensuring some “me time”. Phones are switched off (or on silent) and relaxation is guaranteed. At THRIVEwe have two facial product ranges, namely Esse Probiotic Skin Care and Dr Hauschka. Both products are natural and organic, delighting your senses with beautiful natural fragrances. A basic facial starts with thorough cleansingof the face, neck and decollate, followed by analysing what your skin concerns and needs are. Products are then selected to suite your skin. Exfoliationis followed in order to aid in the desquamation process. This is the skins natural process of eliminating dead skin cells. The life span of a healthy skin cell is approximately 28 days, decreasing with age. Gentle exfoliation is essential to brighten up the complexion, deep cleanse the skin, and allows for increased penetration of products to follow. Facial steamingif is next, allowing the skin to perspire, eliminating make up, oil and dirt. During steam time you can enjoy a relaxing scalp massage. A massageon the face, neck and dec, back of the shoulders and scalp follows, leaving you thoroughly relaxed and indulged (and possibly asleep!). This increases micro circulation (blood, lymph and nerve) and muscle tone. The facial ends with a treatment mask, followed by moisturiserand sun protectionleaving your skin nourished and radiant. You will have a wonderful sense of well being, feeling pampered and a thorough treat for you skin. 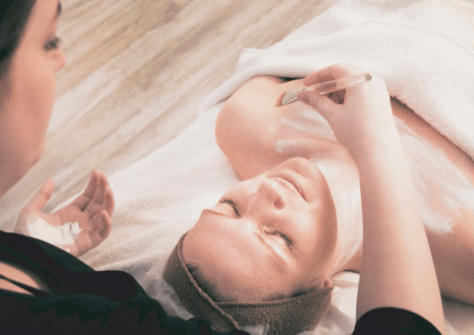 Regular facials make a huge difference to your skin’s health… warning microcirculation they can become addictive!… but for all the right reasons. (or WhatsApp) Hayley at InSkin 0823269884.